Chelation treatments have been used for decades to help patients with a wide range of vascular conditions from heart disease, to stroke, to peripheral vascular disease. A double blind, placebo controlled study published in 2014 demonstrated significant reduction of events in heart attack victims who received a series of Chelation treatments. The effect was most pronounced in diabetics. Chelation is also used for reducing heavy metals such as lead, cadmium and others that are stored in your body over decades. Lead has been shown to be damaging to the brain and the cardiovascular system. Cadmium is a known carcinogen. Gadolinium has been demonstrated to accumulate in the brain, while aluminum and mercury are known to be toxic to the brain. Click here to read about Heavy Metal testing. Although chelation is not an FDA approved treatment for reducing body stores of chronic heavy metals, logic, supported by extensive research, supports the value of diminishing toxic heavy metals from our systems. Time: Calcium ETDA take approximately 60 minutes to infuse. DMPS takes approximately 3 hours to infuse. The word chelation is used to describe the process of removing toxins and heavy metals from the cells and organs of the body. The best way to do this is through intravenous vitamins and a substance called EDTA, which is an amino acid that has been in used since the 1950's and is FDA approved to treat lead poisoning. Heavy metals like lead, aluminum, mercury and cadmium are all toxic to the body and can increase the risk of cancer, heart disease, dementia and other degenerative conditions. Many clients choose to have their heavy metals removed as part of a preventative step. Heavy metals are everywhere. They can be found in dust, in our food, cups and glasses. Seafood, cosmetics and even our drinking water can contain heavy metals. Those of us who were born before 1980 also have been exposed to lead gas and lead paint. Lead has a half-life in the body of over 25 years. The Journal of the American Medical Association published a study that demonstrated a decrease in cardiac complications (such as stroke and heart attack) in clients with prior heart disease who received a cycle of chelation therapy treatments. Many clients have experienced a reduction in chest pain from angina, reduction in blood pressure, and many other positive changes after treatment. Other clients who have coronary artery disease have chosen to use chelation therapy cycles as part of a preventative care strategy. Some of our clients have reported improvement in lower extremity pain from blocked arteries after chelation therapy. People suffering from diabetic ulcers have also noted improved healing. Many clients choose to remove heavy metals to help prevent the possibility of damage caused to the brain through exposure over time. Clients with impaired memory have reported improvement after chelation therapy. Heavy metals can interfere with our pituitary-gonadal axis and may be a factor in low testosterone syndrome in both men and women. Heavy metals are considered to be a contributing factor to the high rates of cancer in the America. Many clients choose to reduce their heavy metals to reduce their risk of cancer. Clients with active cancer, or a prior history of cancer have used chelation as part of their treatment strategy. Since the 1950's Chelation therapy has been given to over 300,000 clients and over 3 million treatments. There have been no fatalities and few serious complications as a result of this treatment when administered by physicians using the standard protocol of the Academy College of Advanced Medicine. Clients must first be examined I.M. 120 (including a review of blood work) to make sure that chelation therapy is appropriate. All clients who receive chelation therapy are monitored for kidney function through blood work and urine testing. 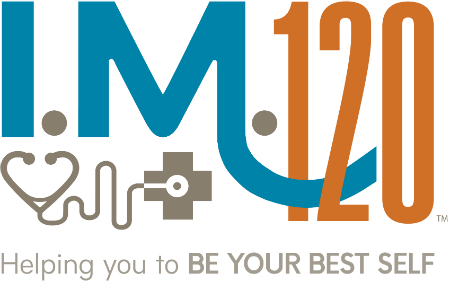 Clients occasionally experience fatigue, dizziness and mild nausea, but these side effects are temporary and I.M 120 will be available to help reverse them if they occur. Infusions are painless after the initial pinch of the skin when the IV needle is inserted. After that, there is no pain. How do I know if chelation therapy is right for me? Due to the extent of exposure that we receive on a daily basis to dangerous heavy metals, virtually everyone can benefit from one of the chelation protocols at I.M. 120. The intensity of the recommended treatment will be determined at the time of your consultation with I.M. 120.
Who can administer chelation therapy? Any licensed physician can administer treatment. Infusions are done in an outpatient setting at I.M. 120. Is chelation therapy FDA approved? EDTA, the amino acid that is the primary ingredient in chelation is FDA approved for lead detoxification. When it is used as part of a treatment for the variety of conditions described above, it is considered to be an "off label" use. Such practices are very common throughout medicine and physicians have the freedom to safely help their clients through the use of their experience with and knowledge of the substance. Is chelation covered by insurance? Insurance companies generally do not pay for chelation therapy. Funds from a health savings account can be used in some cases.